This is the ethereal yet concrete fine poetry of a master poet. In “Chester and the Bluebird,” a spirited bluebird standing in for a beloved pet steer, just reduced to sizzling steaks on the family barbecue, is Rose’s respectful reply to the classic, important image of a “red wheel/barrow/glazed with rain/water/beside the white/chickens,” written by the pillar of Objectivism, William Carlos Williams. 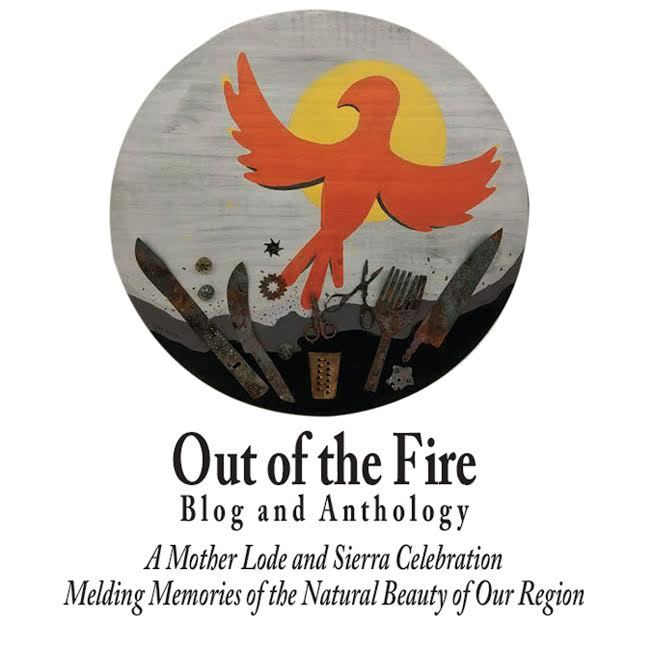 The poetry in this collection has been forged and tempered over decades of writing, while also teaching English at the secondary and college level; attending numerous workshops with some of the best writers of our time; and promoting and showcasing the work of her fellow writers and artists through founding Writers Unlimited and editing and publishing the Manzanita anthologies and other publications. With the publication of River by the Glass, we at last have the collected poetry to date, of the hardest working poet I have been privileged to know. GlenHill is proud to present these fruits of her long labor. Order River by the Glass! River by the Glass is ready to ship! Monika Rose wants you to sip and dip in! It’s your glass and you can cry if you want to. But you won’t cry ~ most of the poems will make you see aspects of life once again, from your own buried memories. Bring up those shards and hold them up to the light! There are pieces for everyone, encompassing a wide swath of subjects. You will be awash in reflective delight. Poetry is meant to shake you and make you think about what is really important. Forget the movie you had planned. Sit down and swim in the important aspects of life that you will create within yourself. And enjoy the beautiful river photos by Ron Pickup, Tuolumne County renowned photographer and writer and photographer for Sierra Seasons. In fact, there is a mysterious thing you can do with the cover that will astound you! Ron’s cover photo is absolutely astounding when you hold the book in your hands. 216 pages of a two-decade span of poems, polished and shining ready for your reading. Order now! Mail a check made out to Monika Rose c/0 Manzanita Writers Press for $26.50, to cover 21.95 sales price, plus tax, plus shipping. PO Box 632, San Andreas, CA 95249. In fact, order extras for your friends and family for gifts and the upcoming holidays! Allow 3.50 for shipping costs per volume and 8.25% tax per volume. Many of the poems spin around the river themes and flow of life and love and death and explore absurdities and wonders of experience. The kinetic energy from “Tuolumne River” in which a mother’s childbearing cycle winds down into memory, blending with the water, sand and boulder life of the river’s cycle, and her once-productivity, reflects on our time in this world and what we are here to do. “Cleaning Fish” evokes an Elizabeth Bishop kind of experience, but darker. “Variations on a Skipping Stone,” takes you back to your skipping stone days and then turns on you. “Carp” is a hilarious depiction of fisherman wisdom with a twist. And there is that word reflection. River by the Glass ~ depicts mirrors, windows, watery reflections, kaleidoscopic bits of meaning, camera and digital lenses, videorecording lenses, eyeglasses, car windows, glass on art frames, purity of water that should be drinkable but often, isn’t….in any glass, and more. Refractory and reflective ~ visual and visceral ~ the poems force us to see, whatever it is we see or want to see, in a new light. It’s similar to picking up a piece of old glass from another century, and straining to see through its cloudy, hard membrane. We see what we’re able to see, what we construct for ourselves. Read poems about clashes and meldings with nature, elegies to those who have passed before us, quirky poems about life (like “How to Spot a Serial Killer” and “Yellow the Dead Canary” or “Venial Sins” and more. If you’ve ever felt guilty about eating beef, or had sympathies with the rancher’s dilemma, dare to read “Chester and the Bluebird” and/or “Animal, Vegetable, darkly humorous poems with a twist. These are not greeting card poems. Their particular images will evoke your own memories and bring them up to the surface in a bubble of haiku moments. 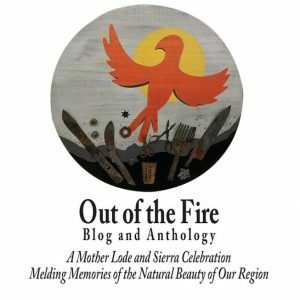 There are romantic or sensual poems like “The Ritual of Coffee Making,” or “Harmonica” or “The Long Dance” and “Coming into Love” and a love of the wild in “What is to Wilderness” –“Deer in the Road” or “Bull Pine” — or even a love poem gone sour, based on ironically sweet-sounding language from the business pages of the Wall Street Journal, called “Love and Finance.” Maybe you’d like to contemplate the metaphysical, with poems like “On the Fence,” in which a fox hanging on barbed wire fence from a child’s memory, linked to a dead fox found in the underbrush, evoking a strong gut-level reaction. “Worms” explores death wriggling from under the concrete walk, and friends who have passed, communicate out from beyond the grave in a universal call of beautiful sadness. Or “You Can Take It With You” makes a person think about the hereafter, with its series of exhibits of life and death. There is the “Estate Sale” and another, “Food for Thought,” searching for meaning in everyday events, as well as “The Other Side,” a touching dialogue between the collective family narrator at a distance, and the dementia-laden speaker who just wants to go home, wherever that may be. Yes, there are poems about death – many of them. The opening poem, “Drowning at the Kern,” provides one of the strongest, lyrical visions of a honeymoon couple separated by the waters of the eternal reality, with the call of a bride echoing eerily in the canyon, while seeing her draped in the algaed strands of river tangle. The Kern River is a dangerous lover. Anyway, I won’t give it all away. There are 85 poems in this collection. You should see the ones that got away! Or rather, dove into the depths. Hid in folders! Dipped down under the waters, chilled to the bone, and looking for cover from boulders and shoulders! River by the Glass just released! 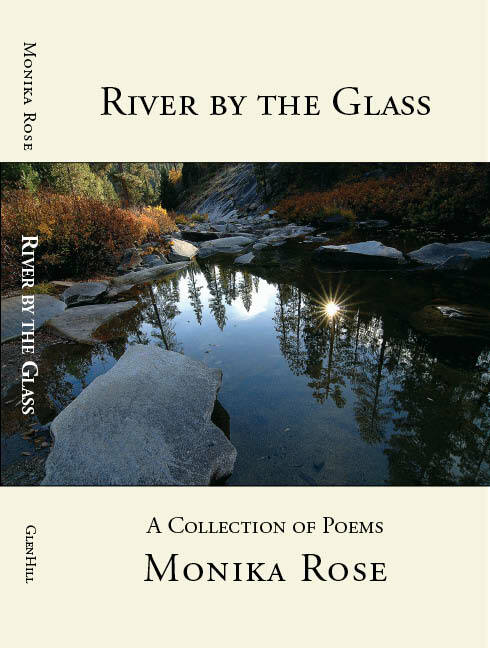 River of Glass just released! by GlenHill Publications. Ron Pickup, Editor at GlenHill has something to say about Monika’s work! My book of poems has a mix of subject matters ~ anywhere from the unpredictable and puzzling world of nature, to the equivocating nature of human kind. Metaphysical poems and whimsical and witty turning over of stones abound. Read a poem a day ~ or two. Read a poem to your child, your loved one, and to yourself. Think of the book as a kaleidoscope and each poetry bit as a smooth shard of colored glass tumbling in the mix. When you stop turning the tube, the glass bits fall into place and form a beautiful design. View that as the poem. You will be able to listen to my interview coming to the site soon, in which I talk about the book and the process of writing poetry, then I read poems from River by the Glass, and more, in the new author interview program called Manzanita Voices ~ hosted by Linda Field, fiction editor of Manzanita Writers Press and Director of Manzanita Voices. This recording is archived from the Manzanita Voices program, which can be heard every first and third Sunday, streamed live at 9:00 A.M. at KVGCradio.com. Or, if you’re in the area of Calaveras or Amador counties, tune in live that morning at 1340 AM. Contact her at writers@kvgcradio.com and let her know how you like the show.